SureDone has the capability to import your eBay Business Policies and use them so you don't have to set your shipping or return policies for every item. It's important to note that SureDone only syncs your Policy Profiles when you click the "Refresh Profiles." So if you go back and add more later, you'll need to skip to Settings > Channels > eBay and refresh your pofiles again. Also, note that Profiles are account specific and each instance of eBay will be required to have it's own profiles. It's important to note that if you are using policies, you must submit all 3 policies when listings items. It is not possible to only use just 1 or 2 policies and then submit the rest of the data manually. Once you are opted in and for subsequent logins, click on My eBay, Account and then Business Policies in the left-hand “My Account” window. This brings you to the section where you’ll be able to create one or many policies in each area (shipping, payment and/or returns). To create a policy and to give you an example, click on Create Policy as shown below. You will then click on the policy you wish to create. In this example, you will click on Shipping. Keep in mind that you may create one or many policies. You will determine how many by your business needs. Here is an example creation of a Shipping Policy. Note: that the Policy name and the settings you build here is what SureDone will import for your use within the system. It’s a great idea to make the Policy name describe your shipping details (example: Default Shipping, General Merchandise Shipping, Fine China Shipping, etc), so that you may recognize the shipping attributes later in SureDone when choosing it. Once in eBay Options, you will see the Profile set a third of the way down. Click on Refresh Policies. 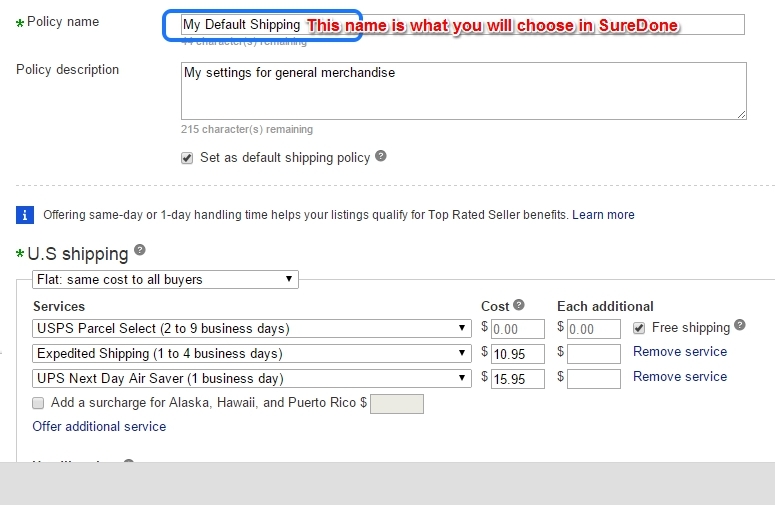 This action will bring in your policies from eBay and create a profile in SureDone. You may create policies at any time and refresh it in SureDone. If you do not wish to use policies and profiles, just leave it on or change it to Don’t Use Profile. You can now go back to the listing page and select the profiles you'd like to use when creating a new product listing.